In honor of James Cameron's birthday today (reminder to send that e-card), here's a fun little fact from way back before Cameron began directing his own feature films. In the '70s Cameron trained with B-movie cult directors like Roger Corman working on various gigs, some of which included creating the art for would-be movies. 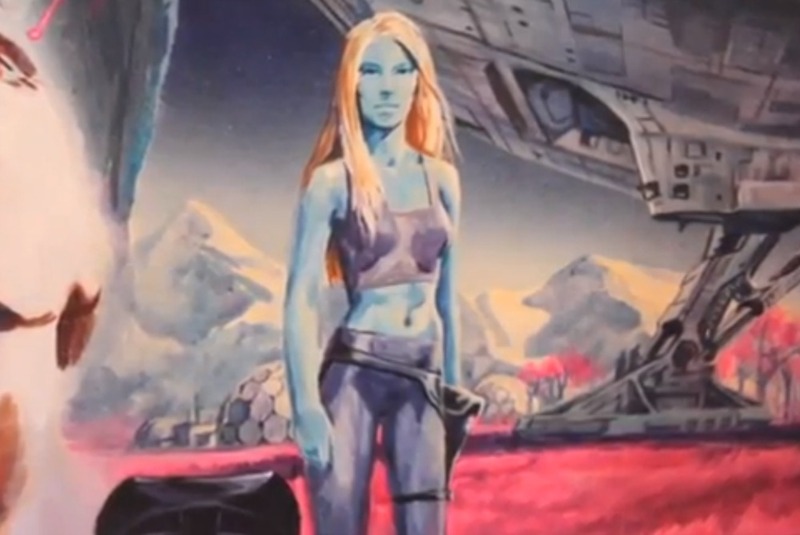 Here, during an episode of Own's Visionaries, Cameron shows off one of his paintings for a movie that never happened, noting a familiar-looking blue girl who would later serve as part of the inspiration for 2009's Avatar. "I used to paint posters for Z-grade movies, and the way I would paint them was that I had a little apartment in Tarzana, California, and I would paint on the back of the bathroom door. And when I wanted to check if the perspective was right in the painting, I would turn the door and look at it in the bathroom mirror. I would see the painting's mirror image, and I would immediately see the flaws." 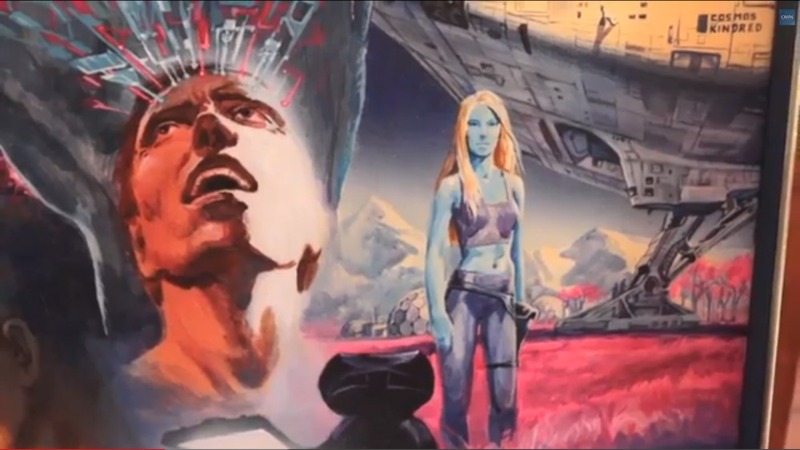 "This [painting] is going back to 1976 I think, and this was for a film project that never went anywhere. The thing that's interesting about it is that I've already got a tall, hot blue girl in that movie. Her name wasn't Neytiri and it was in a completely different context, but I was already thinking about it then." Cameron goes on to admit that many of his ideas come from his dreams. "One of them was a glowing forest with a river of light running through it and trees that sort of looked like fiber optics" he says. "Well, guess what. 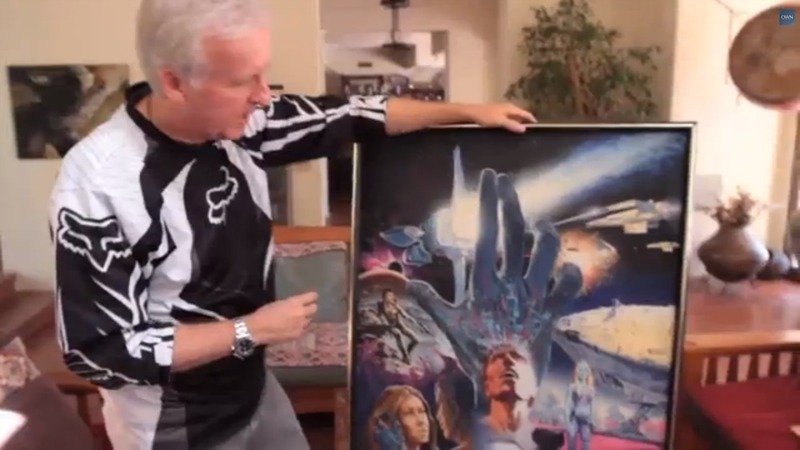 Cut to 30 years later and I'm making a movie where we're spending millions of dollars to create that imagery, but that image came to me in a dream when I was 18 years old." Avatar 2 is currently set to hit theaters in December of 2016.